Through a collaboration between Gyumri Information Technology Center (GTech) and Shirak Regional College, one of the region’s high schools, Shirak students can gain practical experience at GTech, thus enhancing their knowledge and competencies. 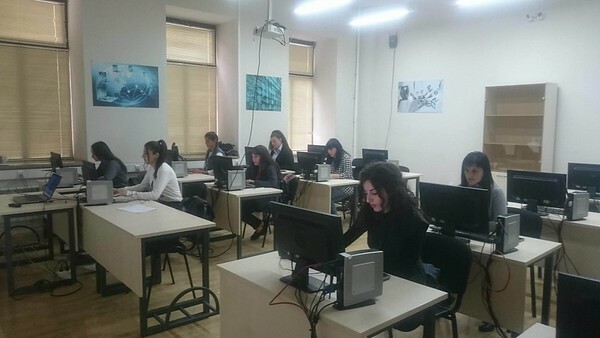 About 100 Shirak students intern at GTech two to three times per week. In addition, GTech staff frequently provide advice and feedback about course curricula at Shirak. The head of the school’s IT department, Gohar Khachatryan, is certain that practical training is invaluable and can help students to specialize. “We have been collaborating with GTech for about 10 years now, and our students are enrolled in practical training. Moreover, our instructors took development courses at the center,” said Ms. Khachatryan. More, the advanced students continue their education at GTech after they graduate. Some even stay on and work there. Larisa Yeghoyan and Susanna Mkrtchyan are enrolled in the faculty of Software Engineering and Automated Systems at Shirak Regional College, where they are seniors. They never miss the chance to enhance their programming skills at GTech and they want to go deeper into JAVA programming, in particular. “What matters most for us is that here at GTech we are closer to the job market. The other priority for us is that we have an opportunity to put our knowledge into practice,” said Susanna. “Yes, the IT environment here is very encouraging. Regardless of what you want to explore, it makes you want to continue,” added Larisa Yeghoyan.